1. Place the frozen mango pieces in a food processor or blender along with the avocado, coconut yogurt, coconut oil, dates, spinach leaves, lime juice, spirulina and plant milk of your choice. 2. 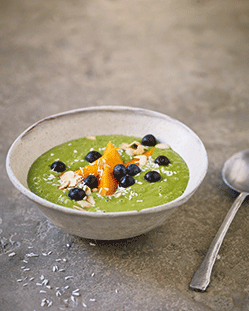 Blitz until completely smooth and serve in a shallow bowl with the fresh mango, a handful of fresh blueberries and a sprinkling of flaked almonds and desiccated coconut. 1. Place the soaked nuts or the oats in a blender along with the water and blend until it turns milky. If making oat milk, try not to over-blend the oats as it will impair the texture. 2. Strain the blended mixture through a sieve or pour into a nut milk bag set over a bowl and squeeze out all the liquid until only pulp remains in the bag. The milk is best fresh, but will keep in the fridge for 3-4 days.